In a Nutshell: In the current landscape of analytics platforms that provide an overload of information, StatCounter stands out by providing its users with an uncomplicated view of the most relevant and actionable information. As a 16-year-old web designer, Aodhan Cullen invented StatCounter to help his small-business clients gauge ROI. Now serving more than 2.5 million active sites and capturing 15 billion pageviews a month, StatCounter helps e-commerce retailers understand their visitors and optimize website performance through robust, yet simplified, data. Online retailers are often so immersed in their products, supply chains, and customer service that they don’t have time to become experts in website statistics too. But with data analysis becoming such an important factor in the evolution of online retail, the choice is often to adapt to current trends or get left behind. Website metrics have been an indicator of success, and a good gauge of ROI, for some time now, but a recent surge of analytics providers has led to information overload. A race has broken out to see which analytics platform can invent new metrics to include in their dashboards, packing them with numbers to the point that the average online retailer needs to hire someone to sort it all out. But StatCounter has taken its analytics business model in the opposite direction. Instead of dashboards filled with data points that are unintelligible to the average retailer, it has maintained a focus on making metrics more accessible. Aodhan Cullen founded StatCounter at the age of 16 for clients to learn about the ROI on the websites he designed. StatCounter is embedded in a website’s code and is regularly tested to make sure it doesn’t affect load time. Once installed, it becomes an easy way to gauge valuable information about site traffic without needing to be an expert analyst. The statistics break down who is visiting a site, where they are coming from, and how much time they are spending on a page among many other metrics. The reason StatCounter is so effective is that it was created to make complex website data simple for anyone to understand — meaning it can also be acted upon quickly. The uncomplicated interface puts data in context by supplying information about why the statistics are significant, allowing members to look at each dataset individually. By offering explanations of the importance of the data — and even educational tools to learn about SEO — StatCounter sets itself apart from the analytics crowd. Its mission to present website stats simply is why StatCounter is used on 2.5 million websites and has been a popular choice for businesses over the last 17 years. StatCounter was created by a 16-year-old Aodhan, who, at the time, was developing websites for local businesses while attending high school. After he was finished building a site, he would hear the same concern from clients again and again. It was a prudent question, and Aodhan searched for an answer but found that no service at the time was doing a good job of providing the type of web analytics his clients sought. So, he made one himself. The StatCounter interface is designed to be simple for online retailers of any background to glean insights. In the beginning, he was just looking to provide a solution for the flower shop or tile company he was designing a website for. But eventually, he opened it up to the world, and StatCounter steadily grew as Aodhan studied computer programming in college. It began with 30-40 signups a day, but by the time graduation rolled around, he knew it could be a sustainable business. From those humble beginnings, StatCounter has grown to serve millions of businesses while maintaining its original commitment to users. Feedback was a major factor in the origin of StatCounter, and it’s still welcomed today as the company continues its mission to make data easier to digest. StatCounter has been developing new features and initiatives based on user feedback, so the team continuously works on products to give members more control of their online prospects — and also more results. StatCounter includes highly relevant information like incoming traffic, visitor paths, and visit length among many others. It has a fully functional demo that shows potential members a complete view of StatCounter’s analytics capabilities. The company also has a simple pricing structure for detailed stats based on the number of visitors while the more simple summary version is free with no visitor limitations. 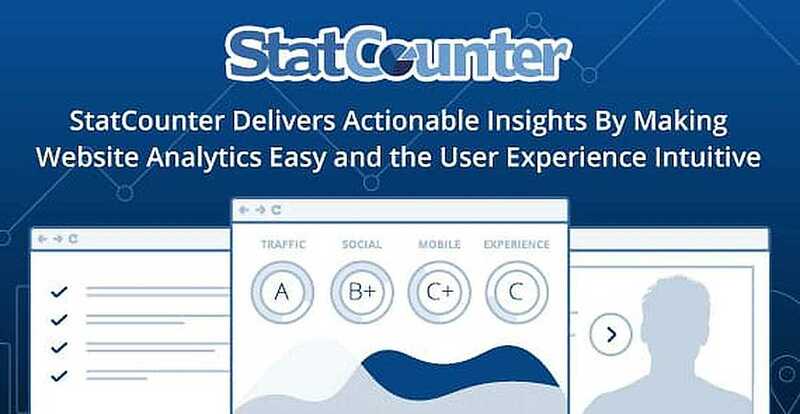 But StatCounter also offers other tools for online businesses to understand what their statistical data means and even gives them a resource to turn to while developing their websites. Being able to determine trends and ask questions before starting on the e-commerce journey is critical, and Aodhan knows some of the pitfalls of growing an online business, especially one with global reach. That is why he created GlobalStats, an updated repository of the latest worldwide trends in digital usage. One particular trend GlobalStats tracks that Aodhan finds relevant for online retailers is the rise of mobile usage. 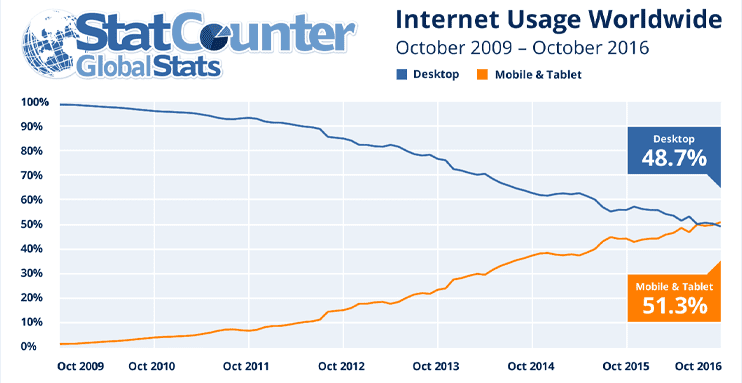 StatCounter created GlobalStats to track worldwide trends like the rise of mobile usage compared to desktops. GlobalStats also provides worldwide browser popularity statistics so developers can focus their efforts on certain browsers to ensure proper performance. Also available are updated statistical data on search, social media, individual devices, operating systems, and even screen resolution. But StatCounter also has resources to educate what all the data means for those without analytics or computer engineering degrees. And if businesses prefer a white-glove approach, StatCounter is also developing a growth service that assists retailers with analysis, execution, and planning. Through StatCounter Insights, relative novices can learn the inner workings of SEO and unlock a deeper perspective into the statistics they have access to. With StatCounter Insights, anyone can learn more about SEO and other website-boosting subjects for free. Another service StatCounter is working on is a Growth Plan for members who want more help with enacting effective strategies and who desire expert analysis. Some StatCounter members already have access to the Growth Plan and have started to see its benefits — and where it differs from other analytics offerings. The Growth Plan hasn’t been widely released yet, but, when it is, expect it to be powerful and highly efficient because StatCounter isn’t about rushing products and features to market. The company prides itself on long-term organic growth by providing members with easy-to-use analytics. With all of the concerns burgeoning online retailers have, the last thing they want to do is look at an analytics dashboard that is hard to decipher. StatCounter understands that modern e-commerce requires an easier way to make sense of data quickly. That mission is evident in the fact that Aodhan has turned down offers from venture capitalists in favor of growing organically and helping small online retailers succeed along the way. For StatCounter, simplifying web analytics for small businesses has been the goal since its inception, and in today’s rapidly expanding e-commerce environment, the company will have plenty of online retailers to help well into the future.